Shanthnu's Vaaimai goes on floors! The shoot for Shanthnu's upcoming film Vaaimai has gone on floors. The film is being directed by Senthil, a former associate of Vasantha Balan. The actor, who had to put on some weight for his role in his previous flick Ammavin Kaipesi, is back in shape to fit into his character in Vaaimai. 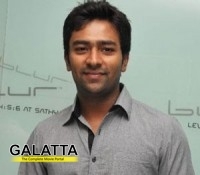 Shanthnu, son of veteran actor Bhagyaraj, made his debut in 2008 in Sakkarakatti. He then acted in films like Siddu +2, Kandaen and Ammavin Kaipesi. He has an upcoming film Amali Thumali, apart from Vaaimai.